I haven't done this kind of post for a very long time, and since i have some new good products, i had to show you ;). They are all good for winter. And its almost all for skin care;) I have really dry and itchy skin true the winter, so i use a lot of different moisturizer for my body, but lately I'm obbsessed with those who smells nice ;). 1. Bettina Barty Cocos, hand and body lotion! I discovered this products a month ago, and i bought it because of a good Cocos smell and not that bed ingredients. It moisturizes skis and it gives a gorgeous smell for hours! It cost about 6€ i think... and it is 500ml package. But i don't think i will buy it again, 'cuz a get tired of the same smell, and i have no idea if i will use it all! ;)) I have a lot of new and different moisturizer! 2. Aldo Vandini Spirit Of India Spicy Body Lotion! I have no idea how much was this one and it comes in a 200ml bottle. I will definitely buy it again!! 3. Aldo Vandini Spirit Of India Spicy Body Spray! It's just a super smelly spray for body that comes with Spicy Body Lotion. 4. Lush Snow Fairy Shower Gel! OMG this is the most nice smell i ever have, the best shower gel! But its the priciest i ever had! 250g cost a little more that 11€. That is just too much for me, but i've heard so much good stuff and i had to bought it! I will use it but i won't buy another one, ok maybe next year, 'cuz that is christmas collection and its limited edition that you can buy it only in winter. And i just find out that it has so bed ingredients. So i won't buy it again! 5. Lush Snow Fairy Lip Tint! It has the same smell like shower gel, like some candies. Its pink color and it's really good lip balm. It gives a little bit of a natural color to your lips. No taste. And good ingredients. Cost about 8 €. And i think it will last for a very long time! Next year if a run out of this one i will buy another one! The only minus of this balm is package. Such a non hygien package! With organic jojoba&organic aloe vera.. This is my favourite face cream for about a year. Im using the 3. bottle. It helps my sensitive and dry skin. I have beautiful skin! The ingredients are perfect! And its not that expensive..8€ for 50ml. Its worth of this money! I will buy another one, when i run out of this one! 7. Sweetscents Green Tea Overnight! The best treatment for pimples. It last forever. I just put some dust on my pimple overnight and tadaaa the pimple is gone in the morning or it's really small. I have no idea how much it cost, but for the time it last its not expensive at all! 8. Tigi Bed Head Manipulator! I will talk about this two products next time in my make up post! 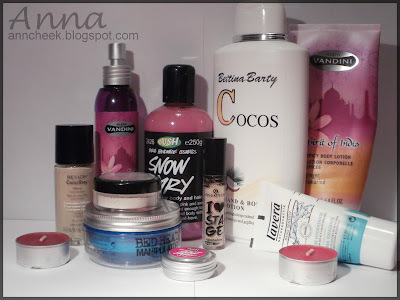 But i used the almost everyday and they are my favourite make up products of november! Leave me link to your favourites in comment! Are you using any of this products? Revlon Color stay is my fav!! !great favs hunni! !